Home » मनोरंजन » The Traditional Red Veil worn by Priyanka Chopra And Deepika Padukone – An Indian trend restored? The Traditional Red Veil worn by Priyanka Chopra And Deepika Padukone – An Indian trend restored? The practice of covering the head, especially by the bride during her wedding, is almost universal. Beyond that, the veil holds different significance for different cultures. Today, for most women across the world, the bridal veil or ghunghat are ornamentations that enhance the bride’s femininity by investing her with the coyness considered ‘politically correct for a newly married bride. The bride’s head is covered during a wedding in almost all parts of the world. This is a rite that is a custom dictated by tradition. In Hindu societies, particularly in the Northern and Eastern states, the bride kept her head covered in her matrimonial home even after she was married and became old. It was a mark of respect towards elders in the family. The lifting of the veil or ghunghat was a part of ancient wedding ritual, symbolising the groom taking possession of the wife, either as lover or as property, or the revelation of the bride by her parents to the groom for his approval. The ghunghat or the veil or chunri was sometimes interpreted as a cover for the face, or a disguise. In times of yore, a sign of chastity and decency in married women was to cover their faces with the ghunghat in the presence of strangers. The putting on of the veil marked the transition from girlhood to womanhood. 2018 has been the year for Bollywood weddings. What began with Bollywood actress Sonam Kapoor and Anand Ahuja’s big-fat Punjabi wedding ended with Priyanka Chopra and Nick Jonas’ grand Jodhpur ceremony. Apart from all the festivities and the merriment, one thing that stood out in all the weddings are the fashion trends that has everybody hooked. The two couple’s looked stunning in their outfits, but what we couldn’t help but notice was the stunning red veil that was constant in the two celebrations. Looking at the pictures and the reactions one can say that the sultry red veil has everyone hooked. The two actresses’ carry the ravishing veil so effortlessly, making it look quite fuss-free. 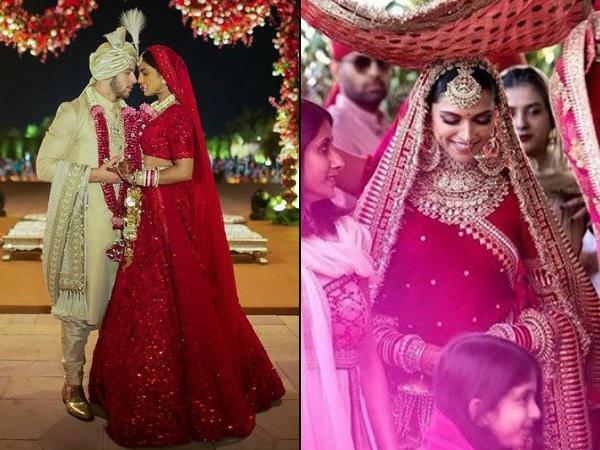 However, the burning question is that did Deepika Padukone and Priyanka Chopra just create a new trend and will more weddings happening this year, see the use of the beautiful red veil? Looking at the peoples reactions, one can say that quite a few of them loved the red-coloured outfits and veils, we can be sure to see them in the upcoming weddings too! Reporter : The Traditional Red Veil worn by Priyanka Chopra And Deepika Padukone - An Indian trend restored? Deepak Thakur Really Guilty or Publicity Gimmick for Cameras in Bigg Boss 12. When Arjun Rampal thanked his team for their help! खतरों से लड़ने के लिए तैयार हैं पहलवान गीता! ओम स्वामी के घृणित कार्य का समर्थन कर रही सोफ़िया हयात!